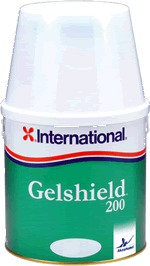 International Gelshield 200 is a quick drying, high performance, two-component epoxy for application to sound gelcoats to help protect against osmosis. A quick drying, high performance, two-component epoxy for application to sound gelcoats to help protect against osmosis. Gelshield is provided in two shades (green and grey) to ensure complete coverage. Suitable for use in temperatures down to 5°C.